Soon Fort Baxter will re-release (an)other oldie(s), this time together with Gravel Road. 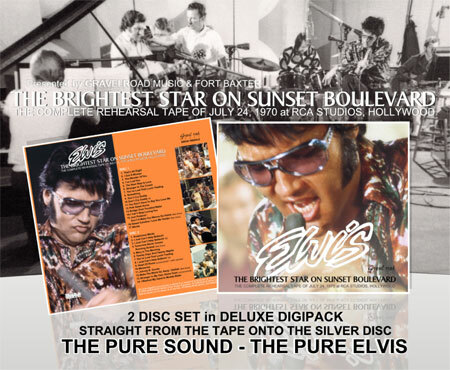 "The Brightest Star On Sunset Boulevard Volume 1 and Volume 2" will be released as a set. After the successful releases of "Vegas Rhythm" and "You know, it don't have to be strictly country –volume 1" we are proud to tell that Fort Baxter wanted to join forces with them ,releasing "The brightest star of sunset boulevard volume 1 and 2". We at Gravelroad music, loved the idea and know the high standards Fort Baxter lives up to. It has to be an excellent release, so we said; " Great let's do it , but…. A 2 cd value Digipack and working with the original recording! So everybody will have the change to have it complete this time". Value for money is needed in these times. The moment we started to work we discovered that the original sound was much clearer and much more spread to left and right. The background instruments where suddenly present. Elvis voice was in the room and were present there at the rehearsal. The CD "You Know, It Don't Have To Be Strictly Country – volume 2" is delayed due to this release. Good things need time. Also various other old Baxter and Bilko titles will be released by us next year from the original tapes and reels. Well, Memphis06, it's "boring" that Elvis died 30 plus years ago! And Espen, you are circumventing the guidelines here as well as undermining our hobby. I missed the first release of vol.1 and 2. So I'll be buying this release, if I can get my hands on it. Always El. Fantastic! I'll buy this. Danke schön,Gravel Road label. Elvis at his best in good sound quality. To Memphis06: the sound samples are still not available so i can't imagine what the .... you have heard. The moaners are getting very boring. I also have heard a sample, and it's only a minor difference. I think the original releases sounded good enough, but I guess some people missed this one back then. To be honest, I want them to release new stuff, not re-re-re-re-re-re-re-re-re-reissues the old stuff. It's getting very boring. I don't see "soon" on my calender. I have the Fort Baxter ones but will buy this one as well. Just afraid for Cd-rot on the originals. I hope in a really improved sound 'cause they are GREAT CD's ! Great sessions! But nothing new for me, I have the original baxter's. We're reaching the end of the barrel, look at those announced re-releases in 2009! For those who missed the first edition some 10 years ago. Try to get these. Very essential session. Great stuff. Great cd's, I have the first release. For the people who missed the first release: Get this one !